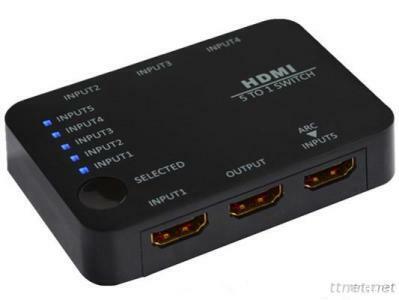 The latest version 1.4 of the HDMI three in one out and five into a switch easily let you put three to five HDMI output devices (such as PS3, HD-DVD, notebook and HD set-top box) simply connected to an HDMI display device (such as a display projector or television). Don't always reconnect, frequently plugged the HDMI line, you just need to several signal source device connected to the HDMI switch on at the same time, want to use any equipment switch to which device, allowing you to easily experience technology into the joy of life. Unique product design, fashion generous, simple operation, it not only has the key to cycle switching, also includes a remote control switch and intelligent recognition switch, standard with a infrared receiving extender control, safe and convenient.